Presenting you Phonepe App Offers, Promo Codes and Coupons for the month October 2017. PhonePe is a one stop UPI-based app which can serve all your payment needs, in a safe and secure manner, powered by YES Bank. Now Recharge any prepaid Mobile/ Datacard/ DTH, pay Postpaid Landline, Datacard and mobile bills for all major operators, Pay for utilities such as electricity and gas bills and get maximum cashback. With Phone pe app you can send and request money from your contacts anytime, anywhere. You can also shop on Flipkart using phonepe wallet. Enjoy 50% cashback upto Rs 100 when you recharge/bill payments on Haptik App through PhonePe. Payment to be made through UPI, Debit Card or Credit Card within the “PhonePe” option on Haptik checkout. Offer period starts 28th September to 31st October 2017. Cashback will be credited into your PhonePe wallet within 24 hours. Valid on 1 transaction (per user). Get 30% cashback on first ever prepaid mobile recharge. Valid 1 time per user. Maximum cashback amount is Rs.30. So to get a benefit of maximum cashback recharge with Rs.100. Offer starts on 1st Sept 2017. Offer is applicable on payment done across any payment mode UPI/ CC/ DC/ Wallet. Enjoy 50% cashback upto Rs 100 on first send money transaction using UPI to any Phonepe User or a VPA or a Bank Account. Valid only for payments using UPI. Offer valid for per registered PhonePe user/ per Smartphone/ per number once on the first transaction. Offer valid till 7th September 2017. 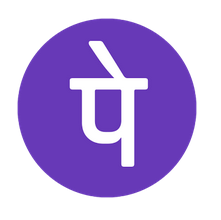 TIP: You can also get 50% cashback upto Rs 50 on your 5th send money transaction to the PhonePe user or Bank Account using UPI. Enjoy Rs 25 cashback on DTH recharge of Rs 250 or more. Offer valid only on 1st, 2nd & 3rd DTH Recharge per registered PhonePe user/ Smartphone/ number. Valid until 31st October 2017. You can avail this offer only once per month. How to Avail This PhonePe App Offers? Cashback will be credited in the PhonePe wallet within one working day. Note: Offer valid from 1st June to 31st August 2017. Now refer your friends to install the PhonePe app and ask him/her to make a transaction and get Rs.100 cashback. Your referred friend will also get 50% cashback after his/her first Send Money UPI transaction. Valid till 7th Sept 2017. Enjoy 10% cashback upto Rs 100 on your BSES Rajdhani bill payments. Offer is applicable from 1st June to 30th June 2017. You can avail this offer maximum 3 times per account. Cashback will be credited to your wallet within 24 hours. You will get 10% cashback on your on BSES Yamuna bill payments. The maximum cashback amount is Rs 100. The Offer is valid from 1st June to 30th June 2017. You can avail this phonepe app offers upto 3 times per account. Cashback will be credited to your wallet within 1 working days. Avail 50% Cashback (Max. Rs.150) on successful transaction via your UPI-linked bank account. Means make your recharge or bill payment at PhonePe App using UPI-linked bank account and get 50% cashback. Choose Payment method as UPI and then enter your MPIN to complete the transaction. Valid transactions for cashback are Bill Payments, Recharges and Sending Money. This offer is available for the first ever transaction using the PhonePe app. This offer is valid from 21st March 2017 to 28th March 2017. You will get 25% cashback when you buy anything from Myntra by paying through the PhonePe app. Just choose “PhonePe” option on Myntra checkout and complete your transaction to get 25% cashback. A maximum cashback of Rs. 500 per transaction can be availed through this offer. Cashback is valid only for the first two transactions within the offer period, starting 17th February 6 pm until 21st February 2017 midnight. Now buy anything on Flipkart by paying through Phonepe UPI and get 30% cashback upto Rs.300. Cashback will apply only on the first transaction during the offer period. No minimum purchase limit for this Offer. The Offer is valid till May 2017. Here is some great Flipkart offers where you can get upto 90% off. Send Rs.1 to any Phonepe user via your UPI Linked bank account and get Rs.50 Cashback in your PhonePe wallet. You can transfer Rs.50 into bank instantly. This offer is valid for new users only. Valid only for first-time users on PhonePe. The offer will expire on 23:59 hours on 13th January 2017. The offer is applicable only on the 1st successful transaction from your linked bank account to another person’s bank account, during this offer period. The transaction value must be higher than Rs 500. Cashback will be credited in Phone Pe wallet within one working day. This offer is valid till 23:59 hours on 12th November 2016. Maximum Cashback amount is Rs.100. 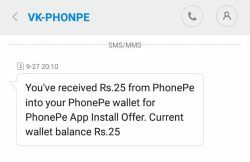 Get Rs.25 wallet balance instantly when you signup on PhonePe App. You can transfer Rs.25 directly into your bank account. Now choose your mobile number (If you use dual Sim mobile) which is registered with your bank account and verify it via OTP. That’s it; you will get Rs 25 instantly. Now click on the menu and go to wallet balance, Now just click & hold your PhonePe wallet icon and drop it to your bank icon. Bingo!! Your balance will be transferred automatically and instantly. This is our today’s updated list of PhonePe App offers. Hope above-mentioned offers will help you to save your money when you make any UPI transaction. I have made transfer from one account to another. There was no refund of any amount. I made 2 post paid payments there was NO CASH BACK. As of now my wallet is NIL. Pl. Analyse the issue and clarify. 20% cashback offer is not valid on postpaid bill payments. Valid on prepaid recharge only.And you have to send Rs.1 using VPA only to any Phonepe user to get Rs.50 back (New Users Only). i m use window phone,pls help me for this application.window phone support yes or no. Yes, go to your window store and download it. I have intalled udio wallet & sign up but not get any rupees. Is this valid on airtel prepaid too???? When u recharge any mobile no. U get 80 rupees in your wallet,money spent above 160 rupees to recharge. On 1 device, u can get only 1 time.